Over the years since it opened in 2010, Chef David Thompson has nurtured and developed nahm at Metropolitan Bangkok into one of the top Thai fine dining restaurants of the world. 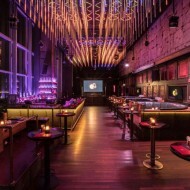 Nahm was awarded the world no. 32 and Asia no. 3 by 50 Best Restaurants. 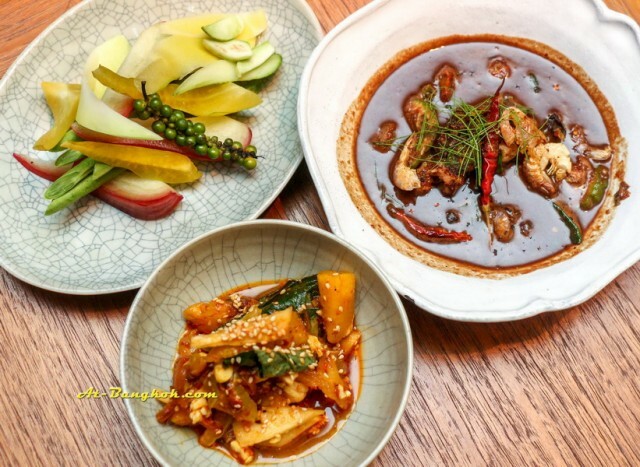 We recently have an opportunity to revisit nahm (see previous review) and see how it has progressed. It is exciting, and fun experience to see a foreigners take on Thai food. We started with drinks. 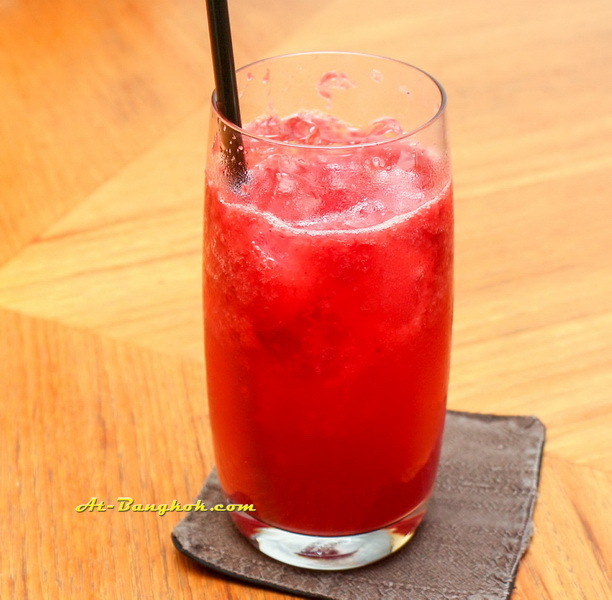 Ginger raspberry (220 baht) a combination of fresh ginger, raspberry puree, and ginger ale. This was a refreshing and delightful fruit soda. Kick it up a notch with Thai sabai (280 baht), a combination of mekhong (Thai brand spirit), white sugar, crush sweet basil and lime. 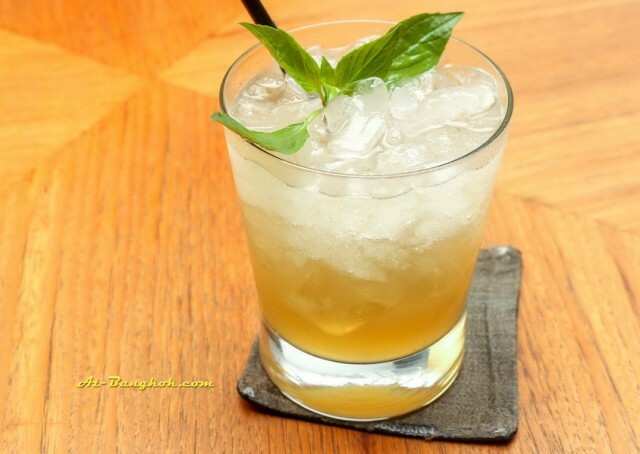 A strong and refreshing drink, similar to mai tai. 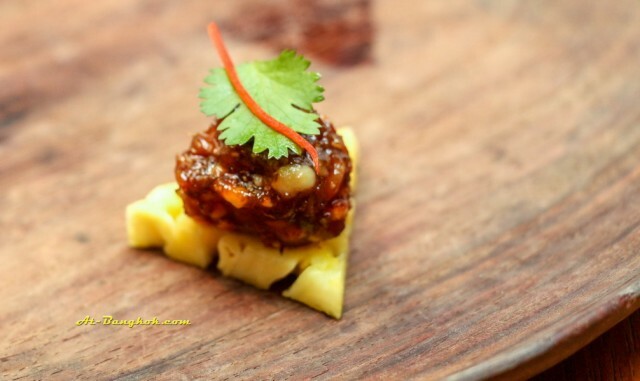 Amuse-bouche: Ma Hor , a rare and old-fashion item, was served complimentary to all customers. Ripe pineapple topped with palm sugar, pork, chicken, shrimp, crushed peanuts, shallots, garlic, cooked until dark brown. The topping was like toffee but a lot more complex. A delightful bite. Canapés: We were instructed that the canapés should be eaten in order, from the mildest taste to the strongest taste. 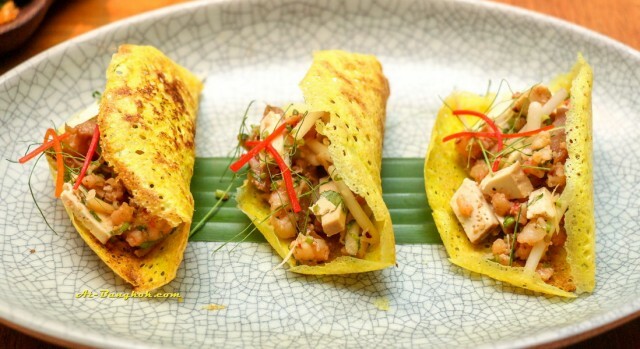 Ka-nom Bueng Yuan, prawn and coconut wafers with peanuts, bean sprouts and pickle ginger. Tasty and crunchy but has a very mild taste. 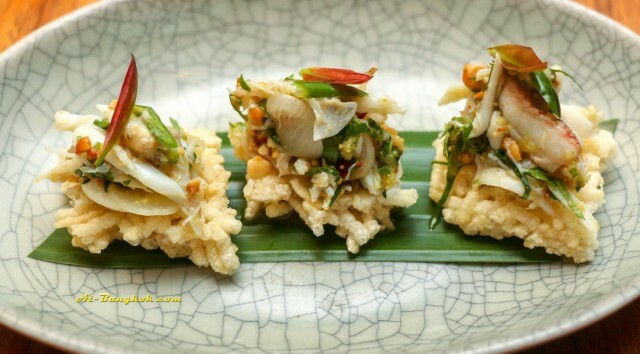 Pu Son Klin, blue swimmer crab, with peanuts and pickled garlic on crispy rice cakes. Still mild but saltier and sweeter. 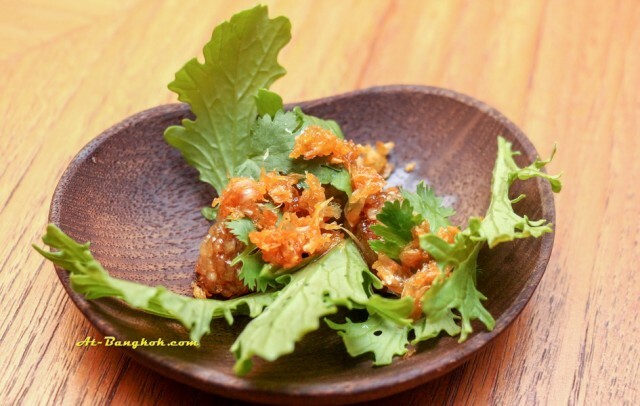 Sa-ku Pla Chon, smoked fish, peanut and tapioca dumplings served with mustard leaves. This bite was more salty and sweet than the last one but the most noticeable was the aromatic smoked fish. 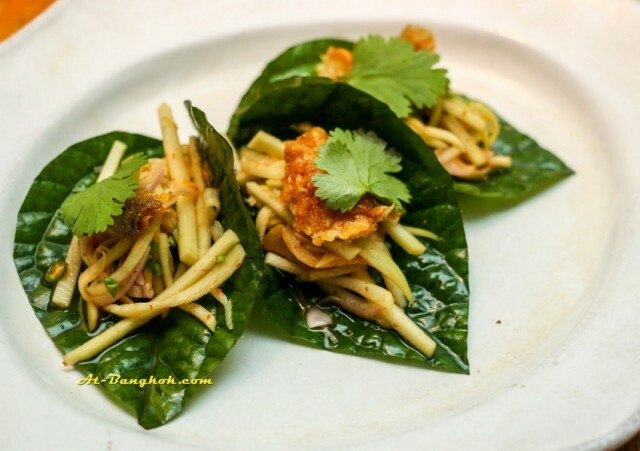 Miang Pla Ku Lau, salted threadfin perch served with ginger, chili and green mango salad on betel leaves. With this bite, the flavor just exploded in our mouth, sweet, tangy, salty and most of noticeable of all was the heat from the chilli. Yum Hed Pa Kung Yang, wild mushroom with grilled prawns and chilli jam. 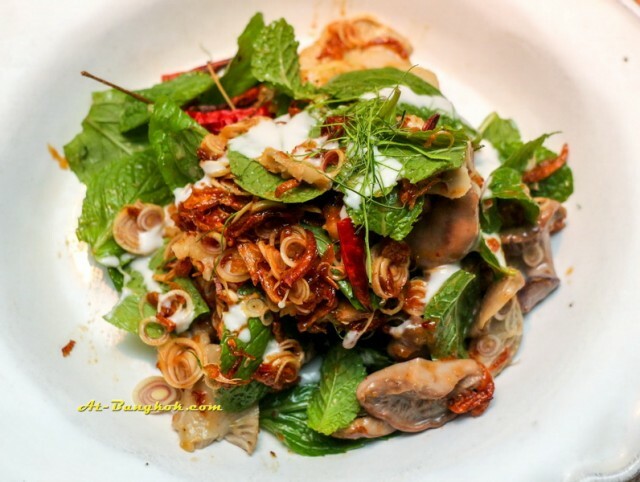 If you had Thai salads before, this would be different from the rest. Same as the other salads offered here. David uses similar ingredients but with small alterations. Making his salad unique. Tom Yum Kai Ka-tee, coconut and chicken soup with deep fried garlic, green mango and chilli. 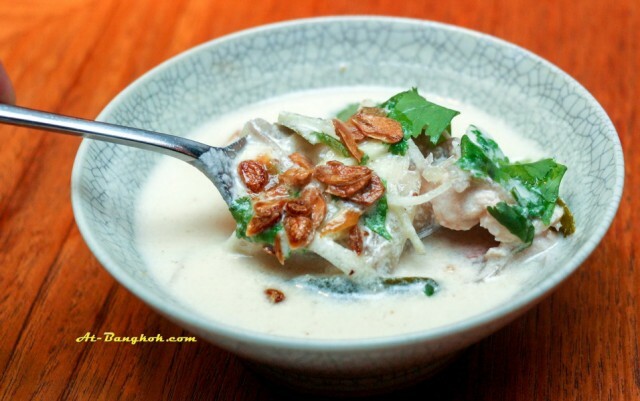 Similar to Tom Kha Kai, a popular Thai dish, this dish did not have galangal but it tasted very good as well. When we had this dish, we noticed that food here does not use lime as a major component for sourness. nahm likes to use a variety of fruits such as raw mangoes, tamarind, and oranges for sourness since sourness should not be monotonous. 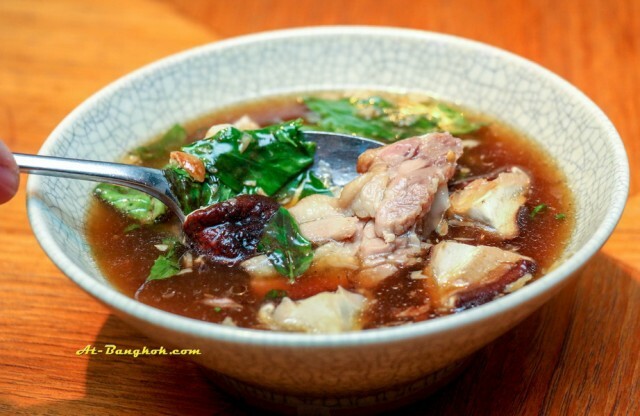 Kang Jued Ped Yang Ma Prao Onn, clear soup of roasted duck with Thai basil and young coconut. The soup was mild and sweet, thanks to the young coconut juice, while the roasted duck was soft and tender. Tom Yum Nuea, hot and sour soup of beef and tripe with coriander. The beef and tripe were tender but not too mushy. The soup had the right amount of spiciness. Relish: Nam Prik Ma-Grood, kaffir lime and smoked fish relish served with sweet pork, salted fish dumplings and coconut poached bamboo and vegetables. This was very good Nam Prik in every sense, the appearance, taste and texture. Again this time Ma Euk was used as an agent for sourness. This was brilliant as it gave the relish an interesting texture and taste. We never thought that a foreigner can design such Nam Prik this well. The sweet pork and the fish dumplings were nice additions. Warning, this is the hottest dish of all we tried that night. It’s not friendly farang hot, it is Thai extremely hot. The chili, herbs and spices slowly stings pretty bad after the second spoon. Curry: Kaeng Tai Pla, smoke fish curry with prawns, chicken livers, cockles, chillies and black pepper. This dish is normally our favorite southern curry dish but we hardly recognized from its appearance. Chicken liver, and blood clams are not common items in this southern dish. It adds an interesting taste and texture to this familiar dish. Once we tasted it, we surely recognized the heat and the smell of fermented fish guts. 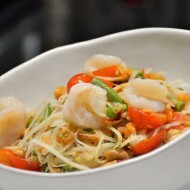 Due to its heat the dish also comes with fresh and pickled fruits and vegetables. This is also a very hot dish. If you know you can’t take this kind of heat. You need to consult the staffs for more milder dish. 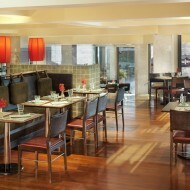 All the dishes were not toned down or adapted to match customers preferences. And you can’t ask for this dish to be milder, every dish goes out of the kitchen the way it is suppose to taste like. 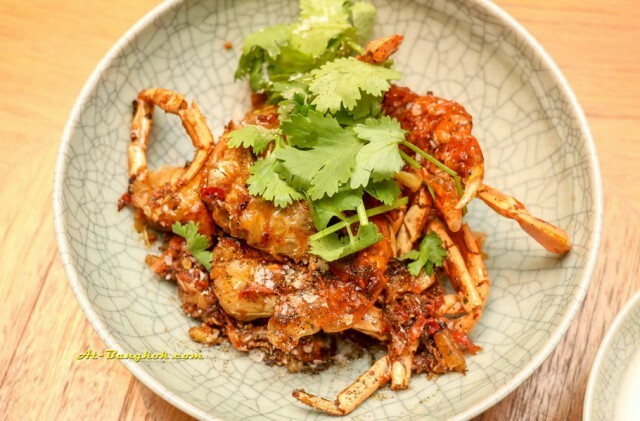 Stir-fried, steamed and grilled sections: Puu Nim Pad Prik Klua, stir-fried soft shell crab with chilli, salt and coriander. Crispy soft shell crab was really well executed. For me it was too salty. The restaurant manager did tell us it would be real salty. 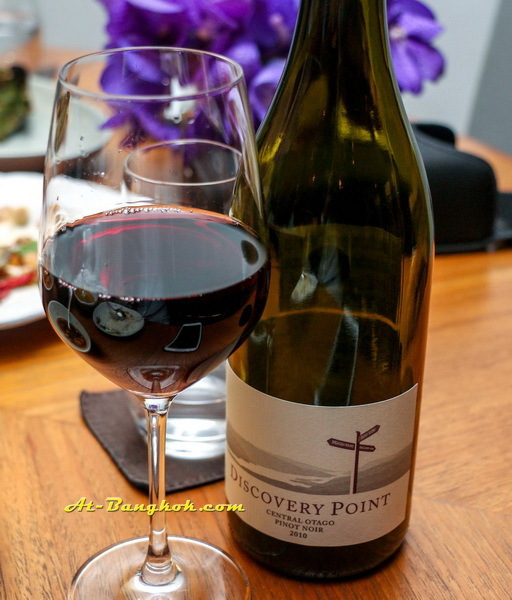 Discovery point, pinot noir, Central Otago, NZ by the glass (475 baht). Recommended by our server, a nice pairing with our meal. 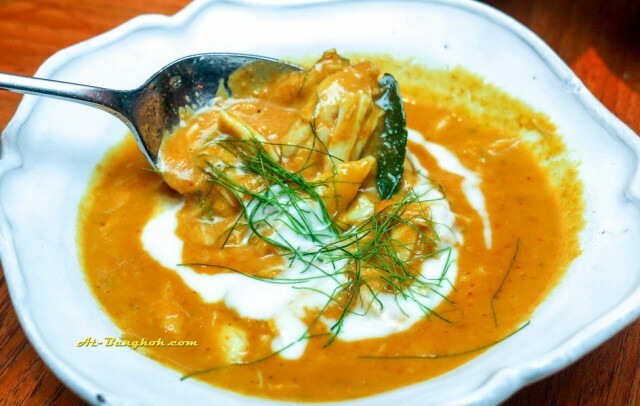 Kaeng Ka-Ti Pu-Ma (620 baht), coconut and turmeric curry of blue swimmer crab with calamansi lime. Our server suggested we order this dish because it has been on the menu from the beginning. 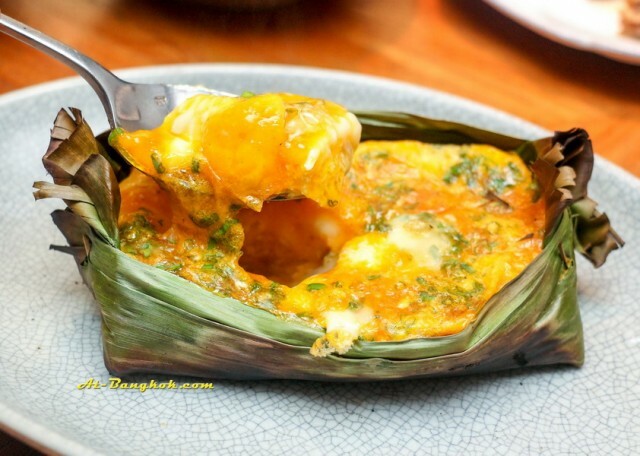 It is one of the most popular dishes at nahm. 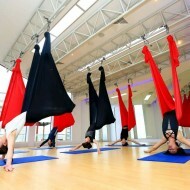 As soon as we tried it we understood why. The curry has a very smooth taste from the rich coconut cream with just a bit of heat and the crab meat was really sweet. Kaeng Pa Moo (600 baht), pork jungle curry with wild cardamom and green bananas. Kaeng Pa is a kind of curry without coconut milk. Usually everything can be thrown into the pot to make this curry and fresh green peppercorns give the dish a different kind of heat. 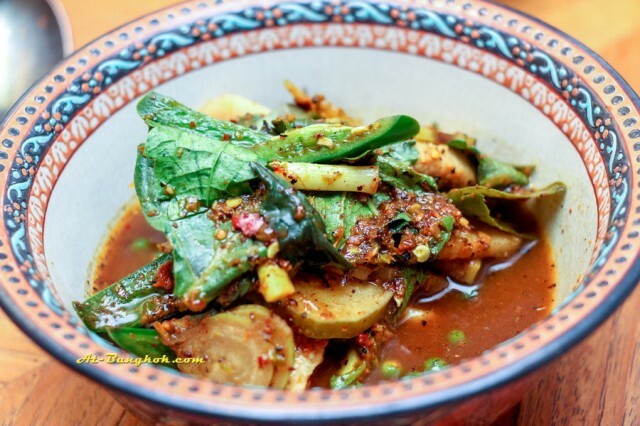 We enjoyed this Kaeng Pa because the variety of vegetables and the right amount of heat. Our server also suggested that we order Kai Pam or grilled omelette to accompany this curry. Kai Pam (180 baht), omelette was beautifully executed by the chef. It was grilled in banana leaves until it almost burnt in the bottom but still runny on the top. Burnt banana leaves added a nice scent. 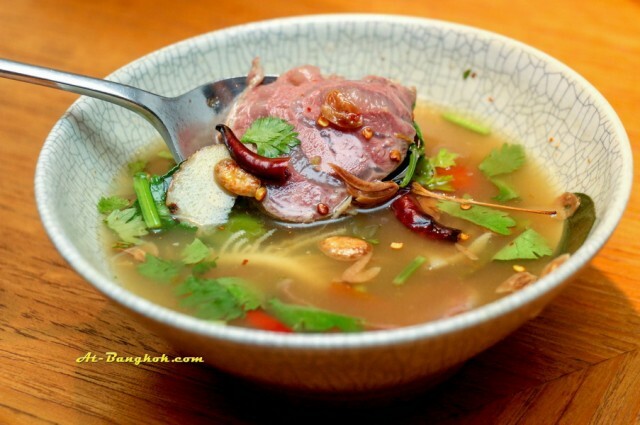 This is an interesting and rare dish, nahm’s version of kai-jeaw. The set menu also comes with a choice of a dessert. Kao Niew Durian Nam Ka-Ti, durian and white sticky rice was really the best we had in years. 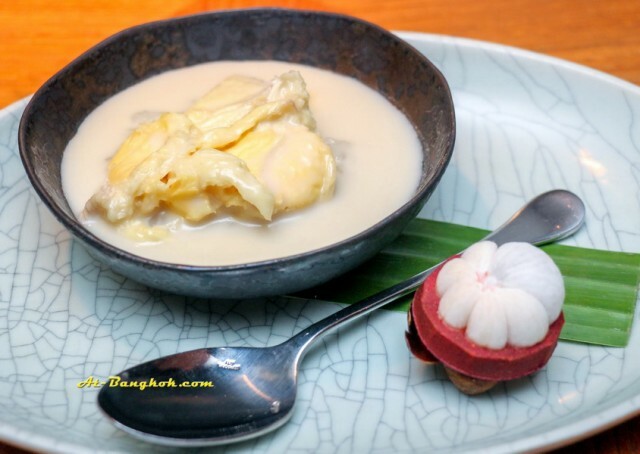 The durian was not too ripe and the coconut milk and sticky rice had the right amount of sweet and saltiness. In Thailand, durian is considered the king of fruit while mangosteen is the queen of fruit. Thai people believe that having too much durian can cause body to overheat. We believe that eating mangosteen would ameliorate the effects from eating durian. 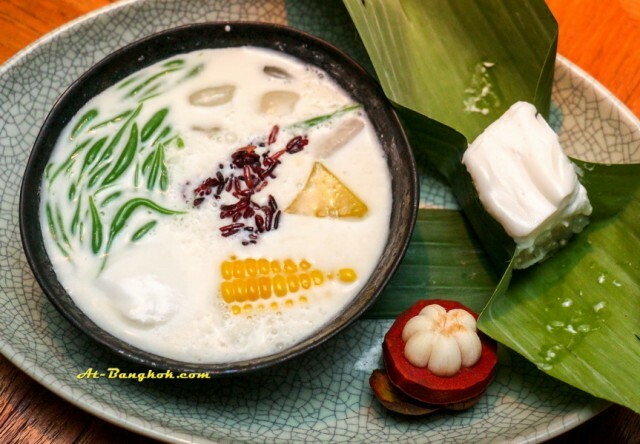 Lod Chong Song Krueang, pandanus noodles with black sticky rice, water chestnuts, tapioca and coconut cream. The dish was almost too pretty to eat. Again this the coconut cream was very delicious. Som Chun, rambutan in scented syrup with Ka-Nom Krok (Thai cup cakes). 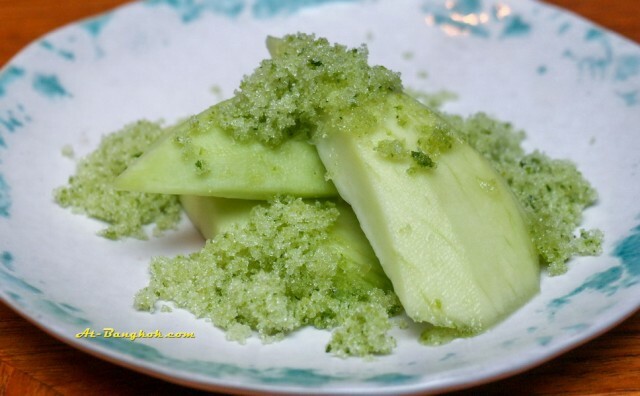 This Thai dessert from and old recipe, not often available. The sweet and tangy rambutan with ice is pretty common. But with fried shallots and shredded ginger makes it a juxtaposition in taste. Chun in Thai means pungent. For people who does not like a heavy dessert. Som Chun is also a nice way to end a meal if you avoid the fried shallots and shredded ginger. And surely it helped us cool things down from all the spicy food we had earlier. 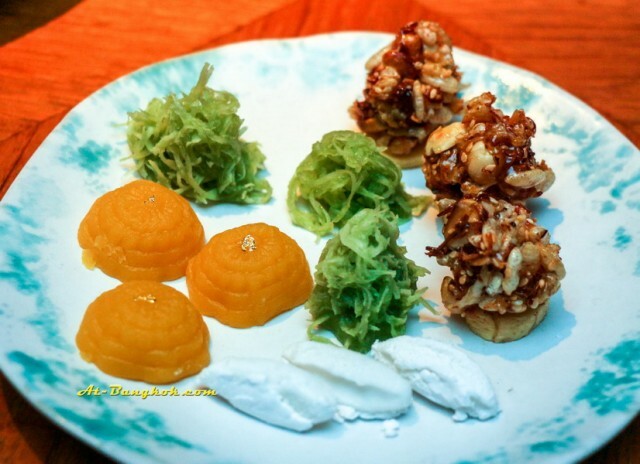 Petite four Thai style: Right: Ka Ya Sart with Kluay Kai, Thai granola on top of Thai banana. 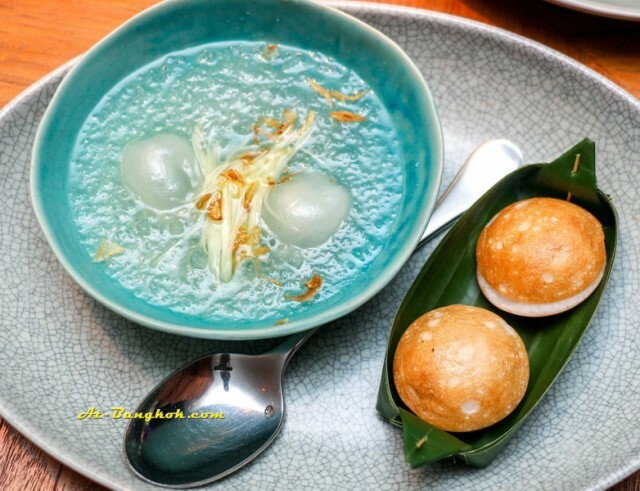 Middle green: Ma Prao Keaw, sweeten coconut with pandanus. Left: Tong Ek: flour,egg yolk, sugar and coconut milk. Bottom: Ha Nu Man Kluk Foon, a combination of young coconut, coconut milk, sugar and mung bean flour. 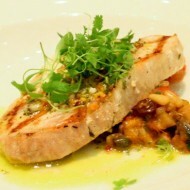 Throughout our whole meal we were impressed with the tastes, ingredients and the accompaniments of many of the dishes. 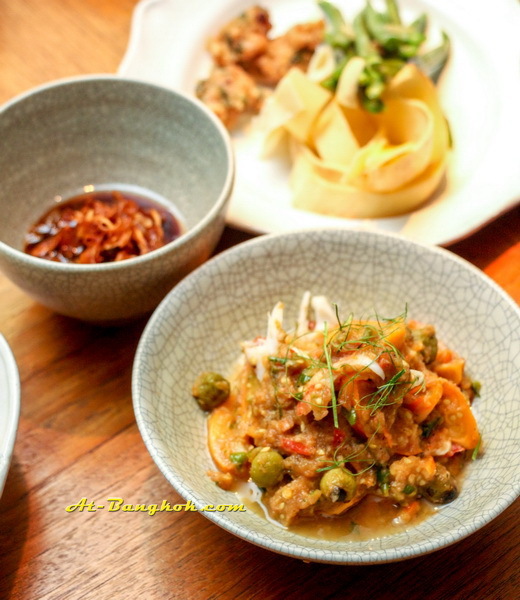 For us who have Thai food on a daily basis, we really admire philosophy of Thai food at nahm. 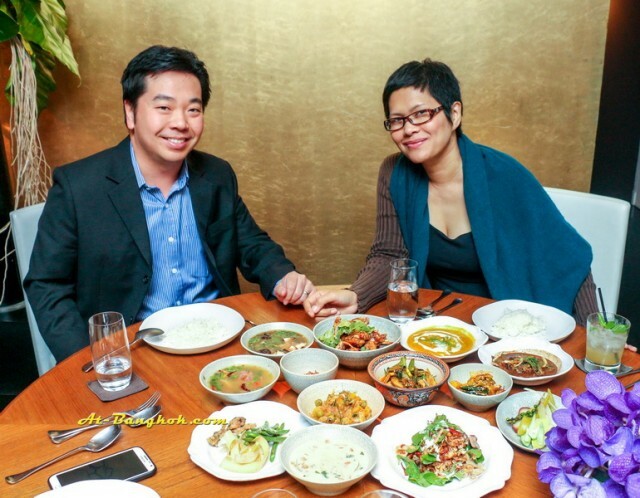 We were not surprised at all why nahm has been so successful thus far. David Thompson food is definitely Thai but with a twist. He uses more ingredients than a usual Thai chef making his food stand out. 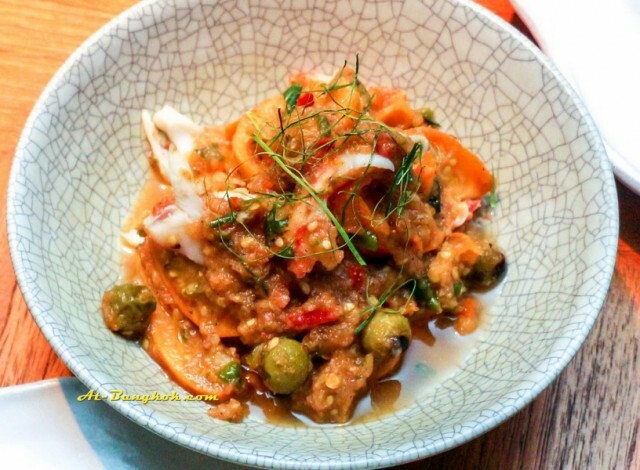 If you think you know Thai food and you haven’t tried the food at nahm, you would be in for a surprise.